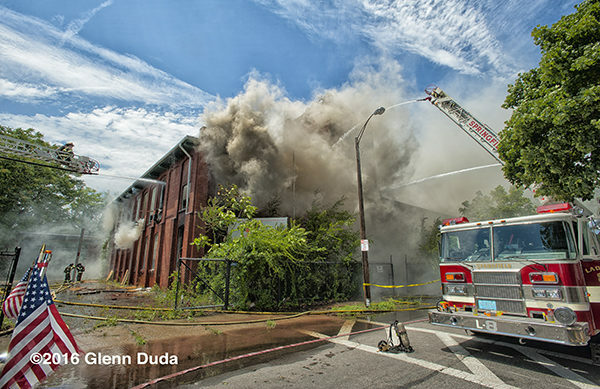 07/04/16 Detroit, MI – Fire tore through several apartments on three floors of this large apartment building leaving many people displaced. 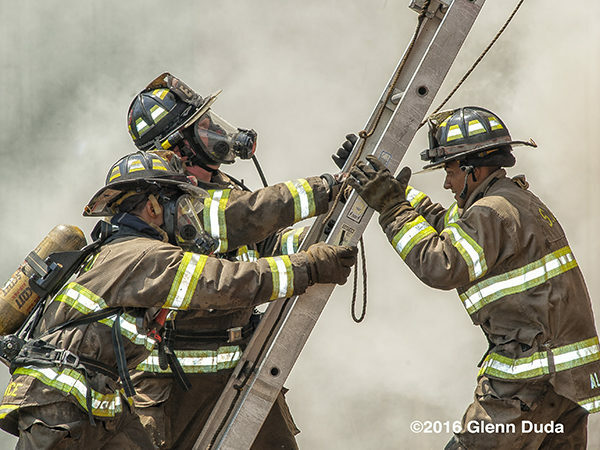 A second alarm was transmitted due to reports of people trapped and the fire conditions on arrival. 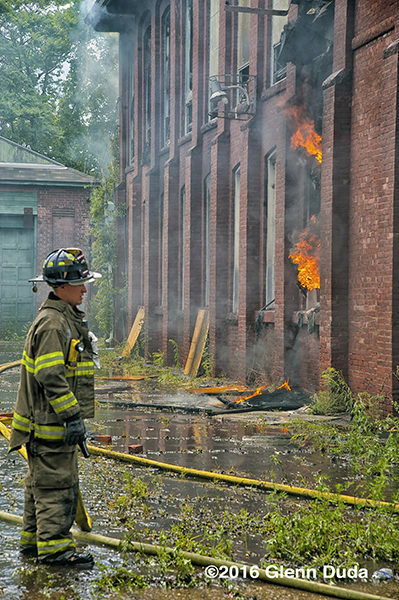 The fire was brought under control by aggressive firefighting. 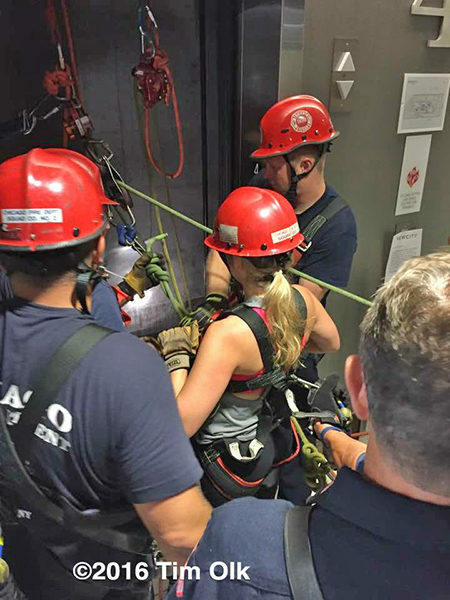 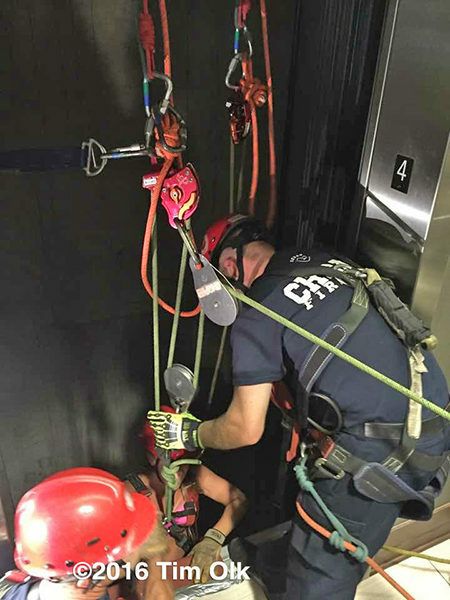 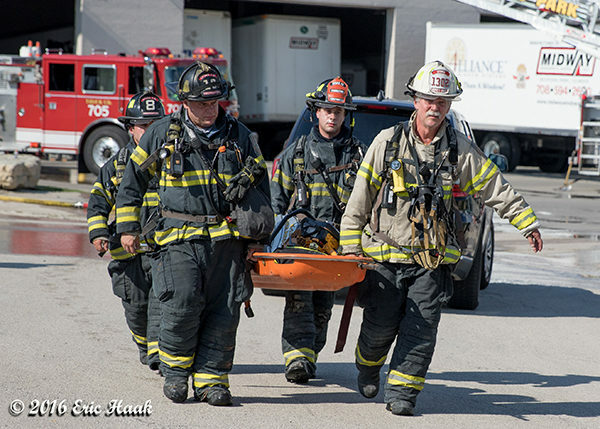 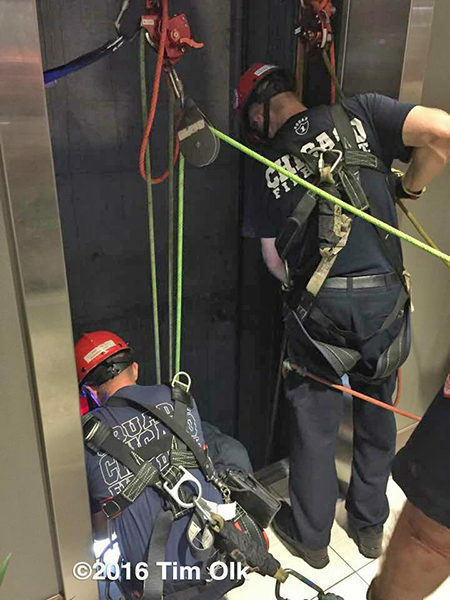 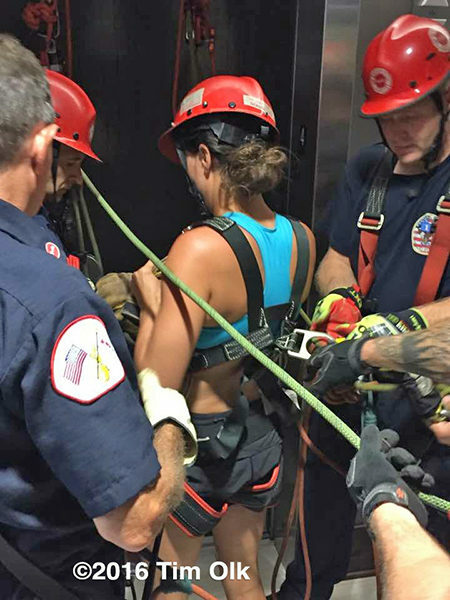 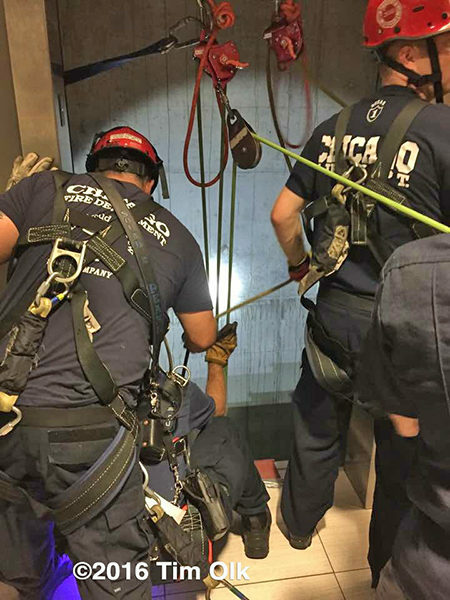 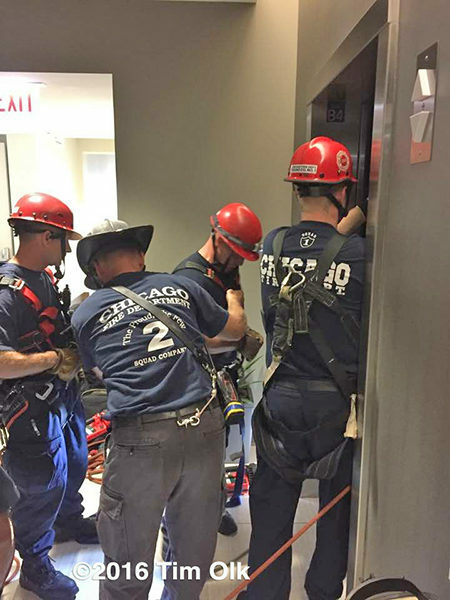 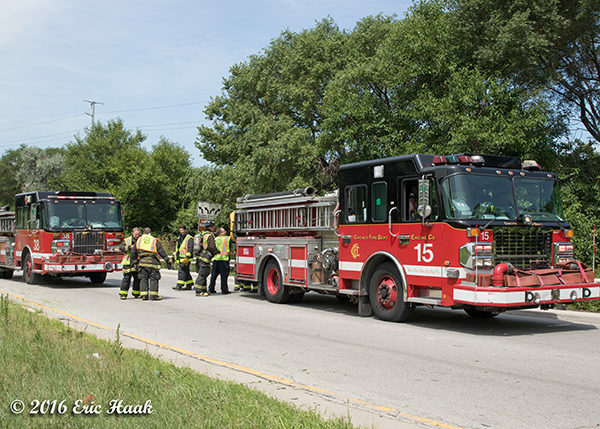 On Sat July 23,2016, Chicago Fire Department Tower Ladder 10 was sent to a high-rise on north Halsted for a report of four people stuck in an elevator. 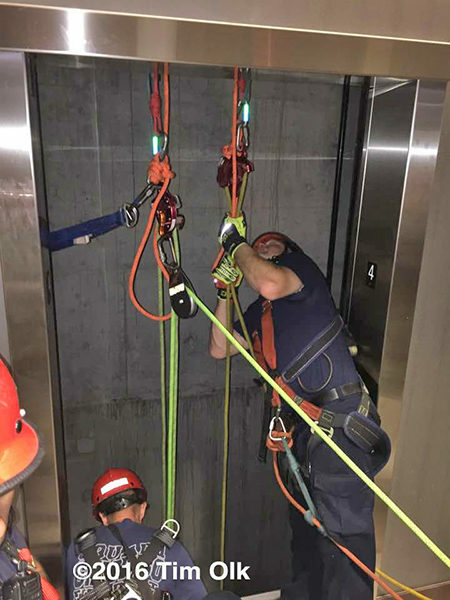 After trying to reset the elevator failed, they requested a blind shaft response. 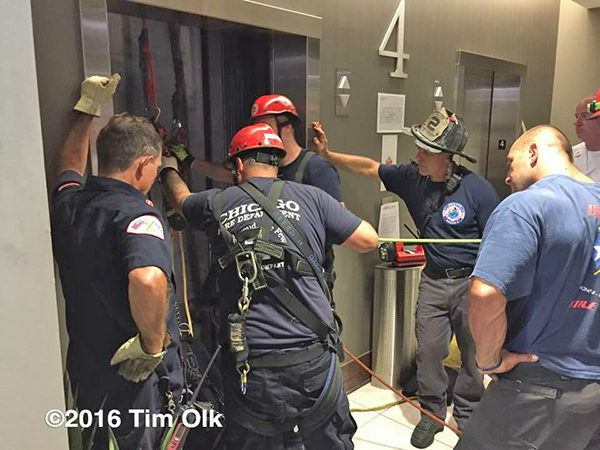 The car was stuck between floors 2&3. 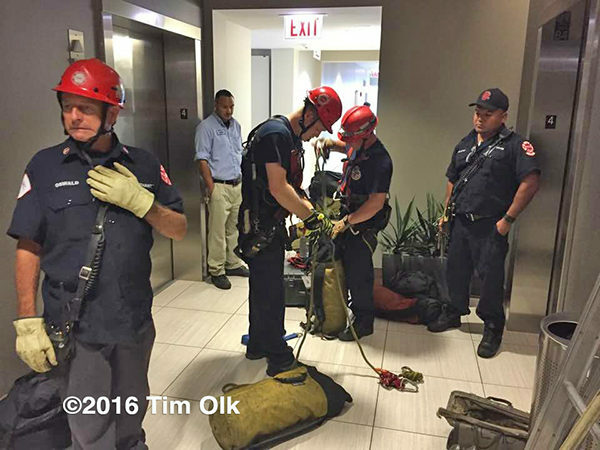 Firefighters locked out the elevator and setup on the 5th floor with ropes and worked off floor 4. 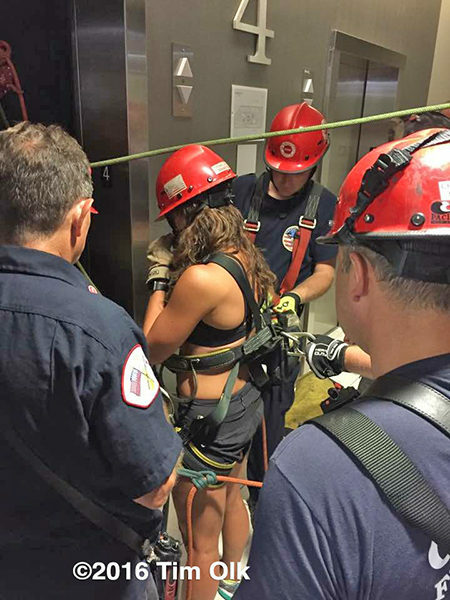 After lowering a firefighter down the shaft, they found four girls who had been in there for two hours but were in good spirits. 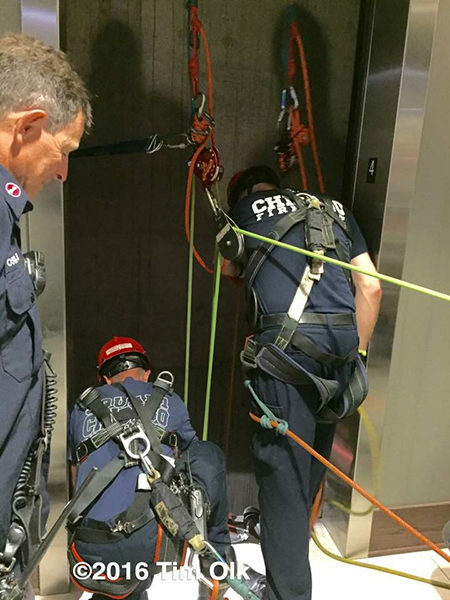 Firefighters brought them to the 4th floor by rope where they were evaluated by paramedics. 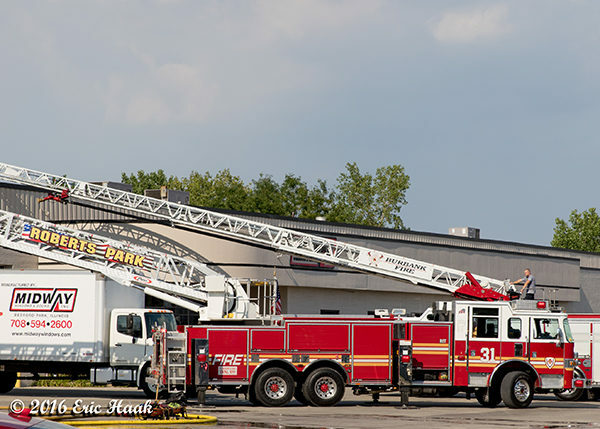 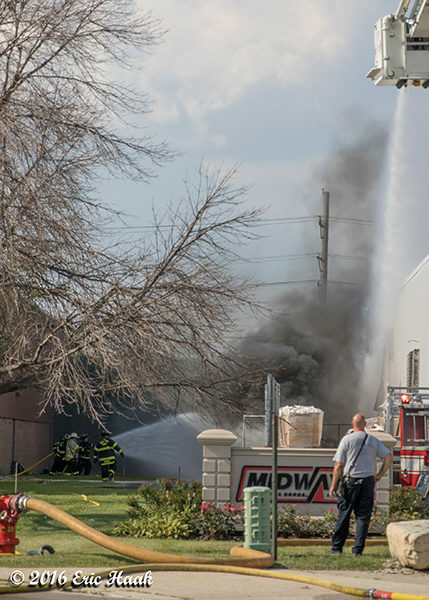 Just before 4:00 p.m. on Wednesday (7/27), the Village of Bedford Park had a fire at the Midway Windows and Doors warehouse. 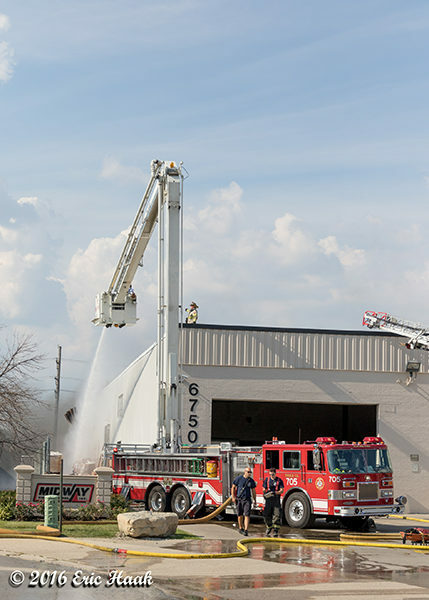 It looked as if there was an exterior fire that burned through the exterior metal clad wall and ignited interior stock and shelving. 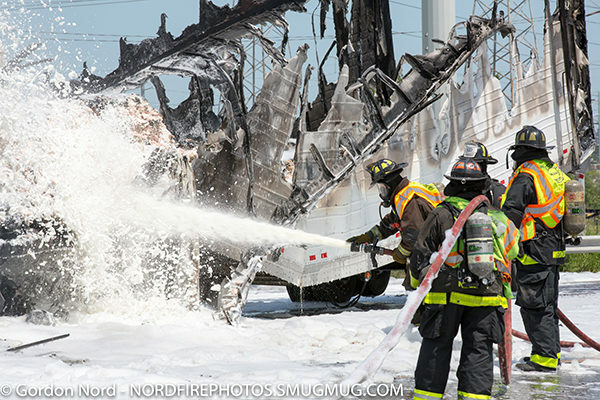 It also appeared that the exterior fire was being fueled possibly by some type of petroleum product. 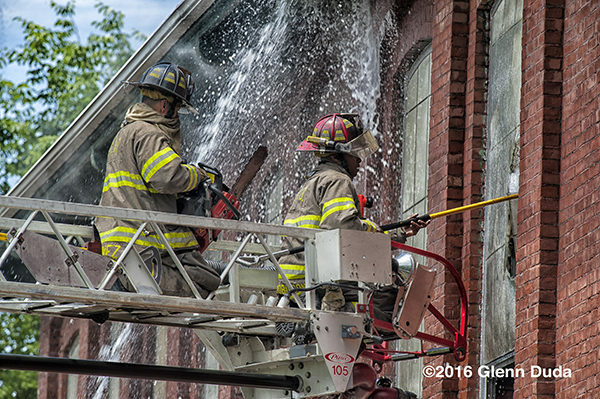 Foam was used to eventually extinguish the exterior fire which flared up several times. 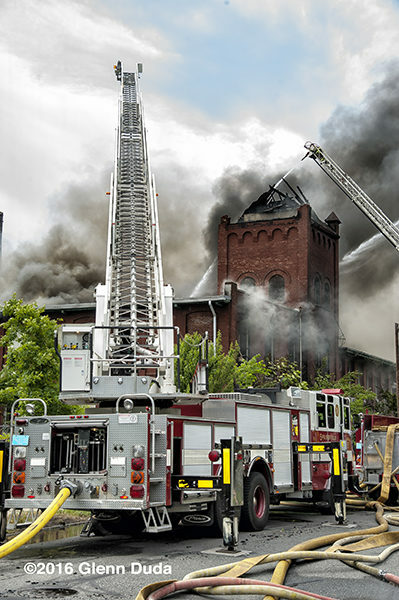 It is hard to see in the images, but the initial fire must have been very intense as it appeared that the fire was hot enough to cause the metal sheeting to fail which allowed fire to enter the structure. 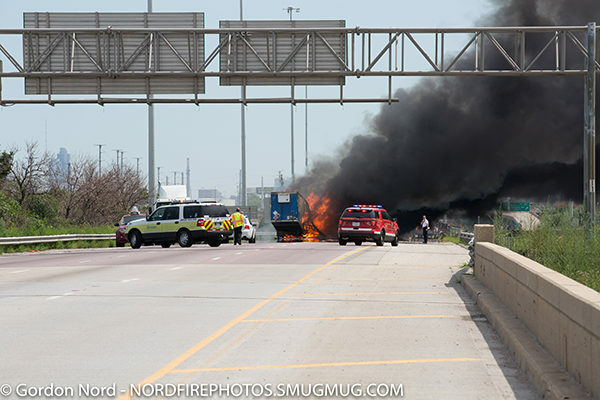 This is all speculation based on what I witnessed and should not be taken as information that was confirmed. 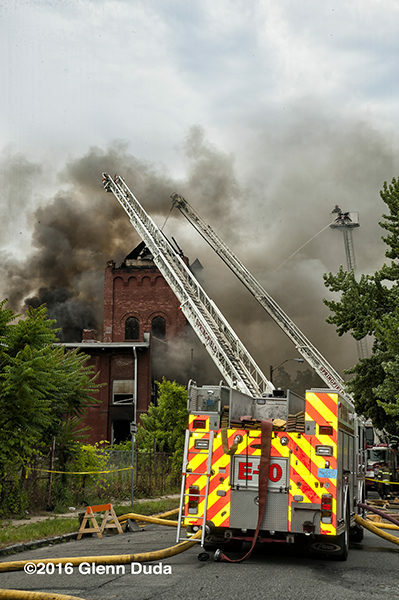 07/03/16 Detroit, MI – On the evening of Sunday, July 3 the Nortown Community Development Corporation got a call that there was a fire at the Philetus W. Norris House at 17815 Mount Elliot in Detroit. 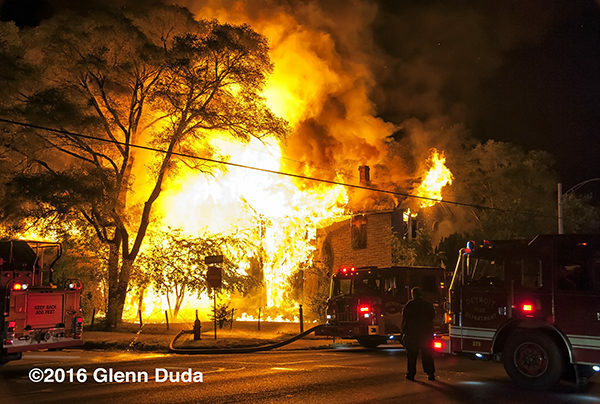 The house was built in 1873 and was the home of Colonel Philetus W. Norris. 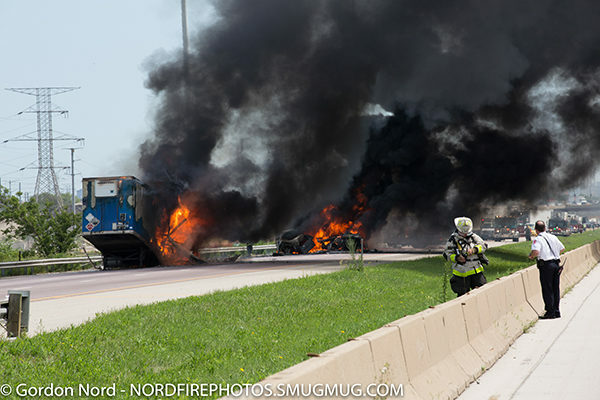 Before starting the Village of Norris he made a name for himself as a spy for the North in the Civil War. 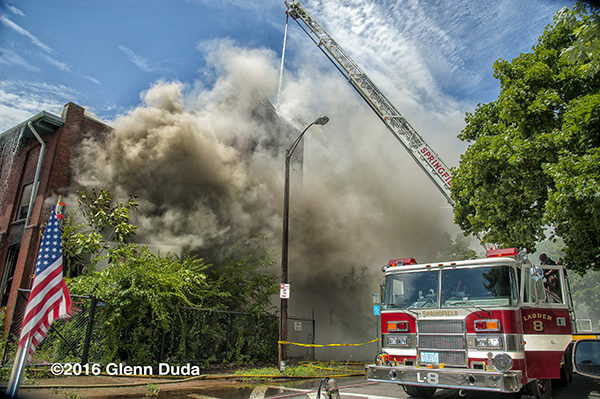 The house was put on the National Register of Historic Places in 1992. 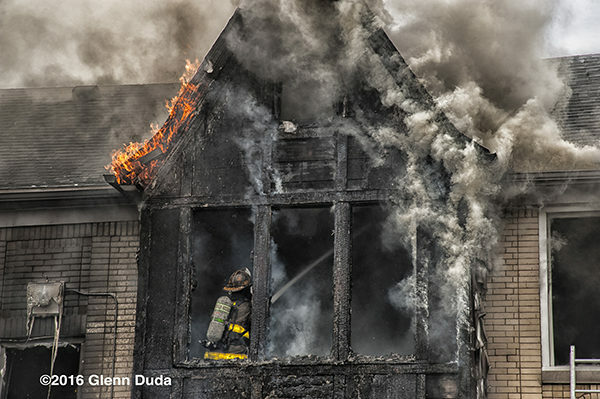 It was designated a city of Detroit historic district in 1995. 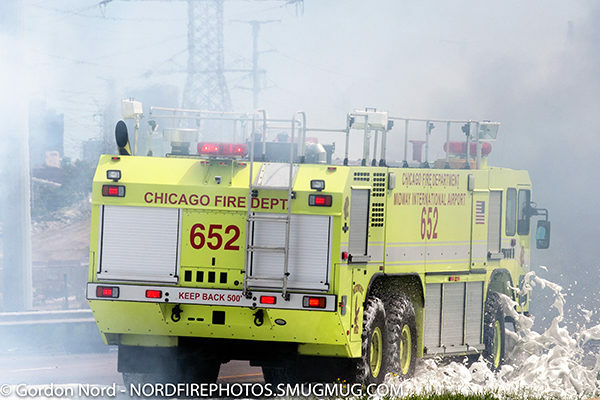 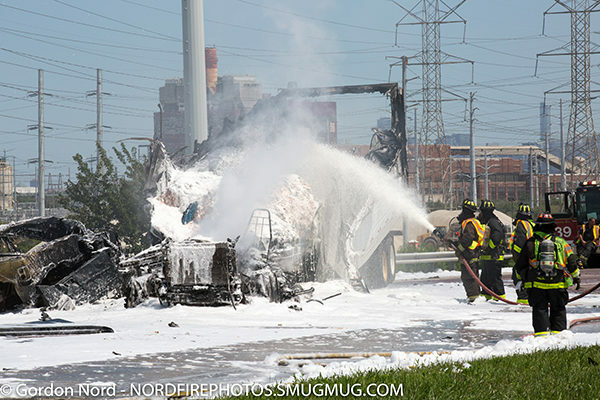 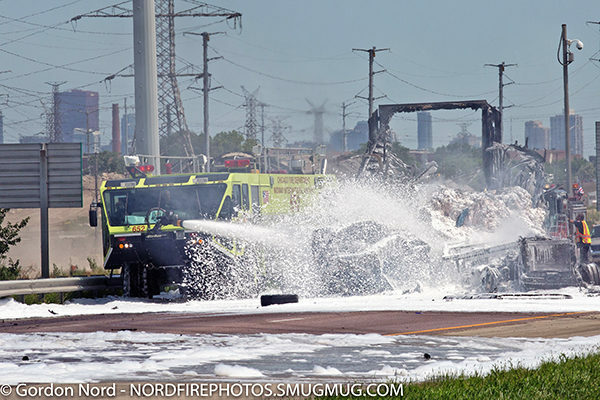 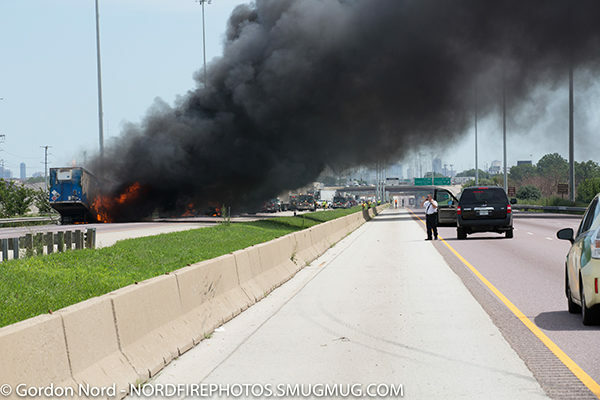 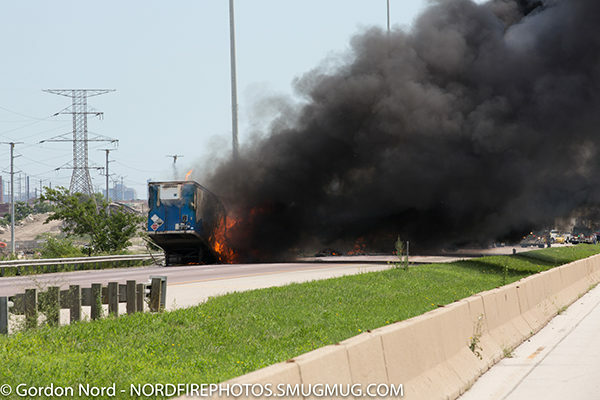 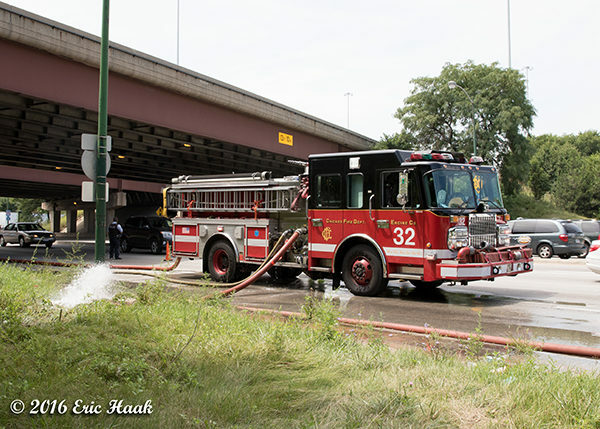 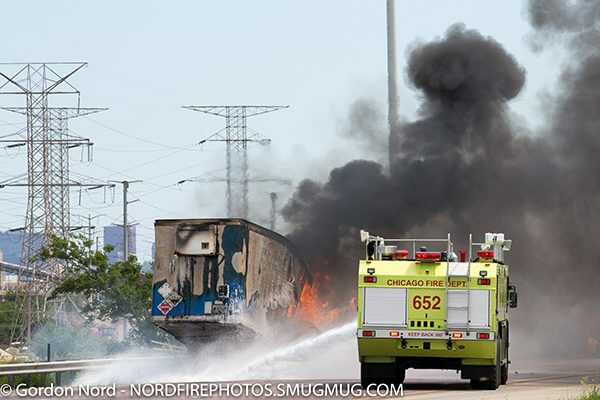 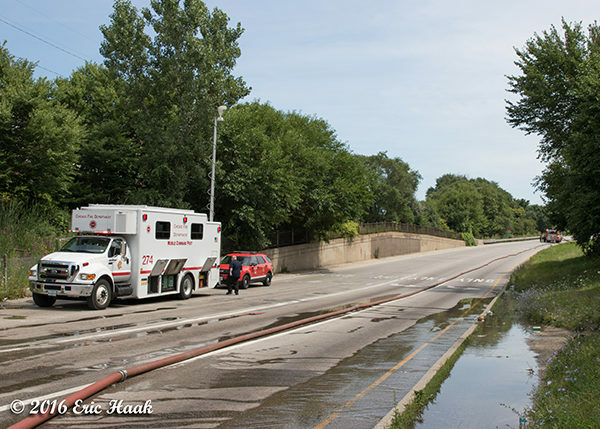 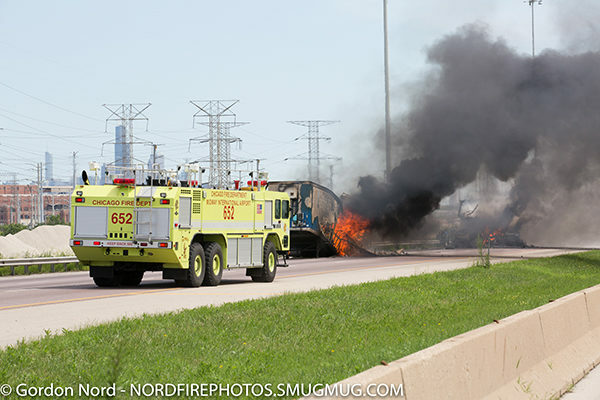 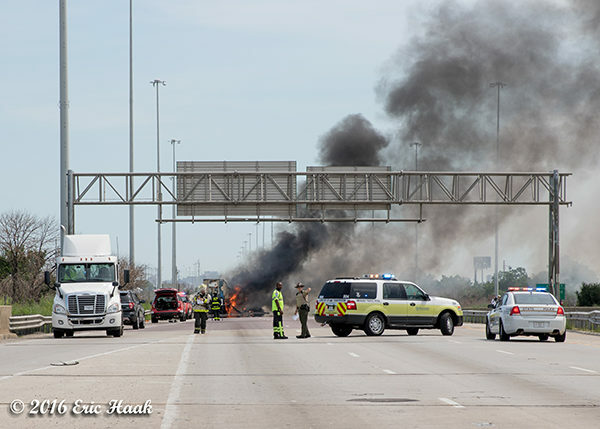 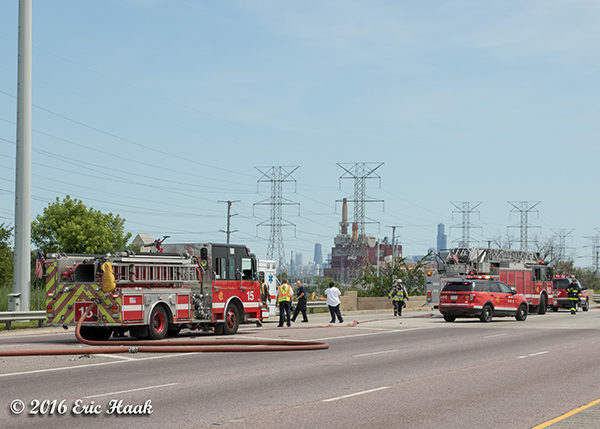 Here are some images from Chicago’s 2-11 Alarm on the southbound Stevenson Expressway east of Cicero Avenue. 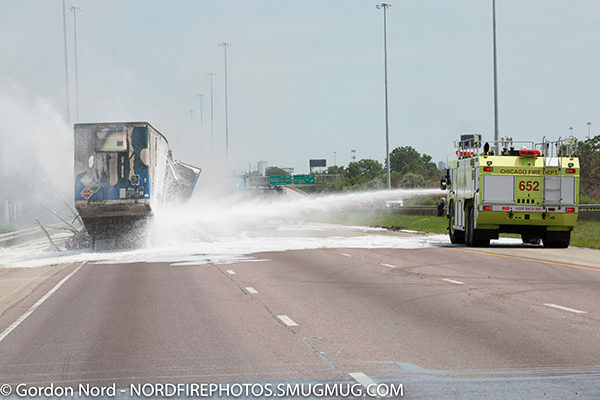 The incident was apparently the result of a car rear-ending a semi carrying paint just before 11 o’clock Monday morning (7/25). 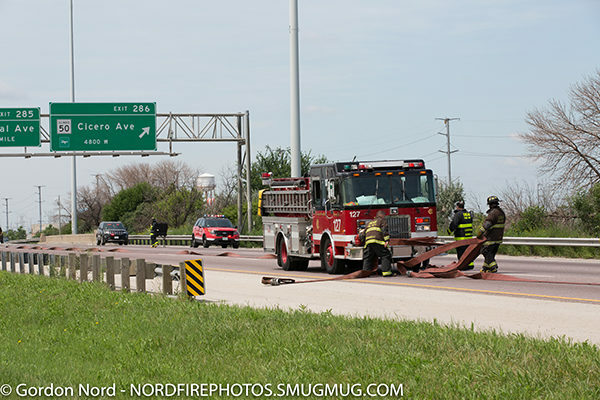 The best I could do was show the extensive in-line operation up the exit ramp to the crash site. 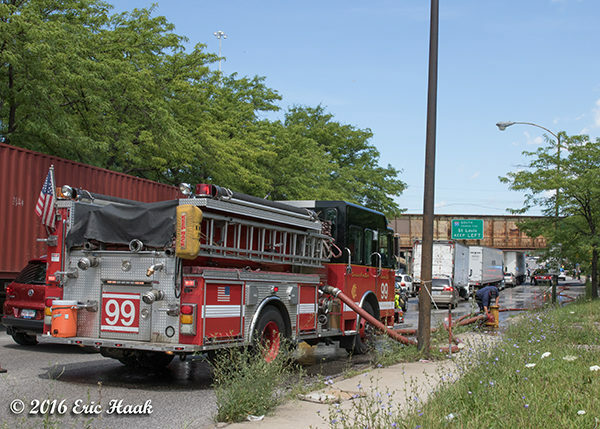 Engines pumping in order from the farthest hydrant were 99-32-38-15-127. 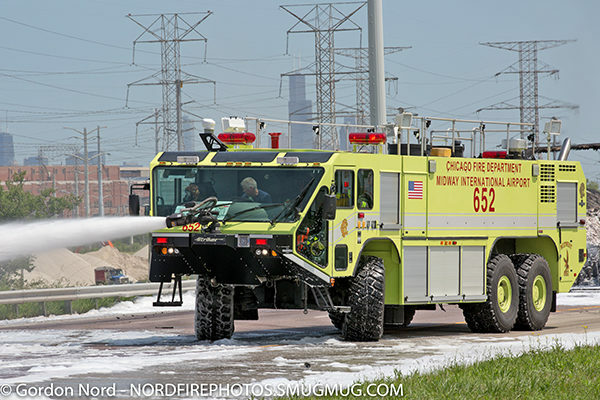 652 responded from Midway Airport but I was only able to get a picture of them as they flew up the off-ramp. 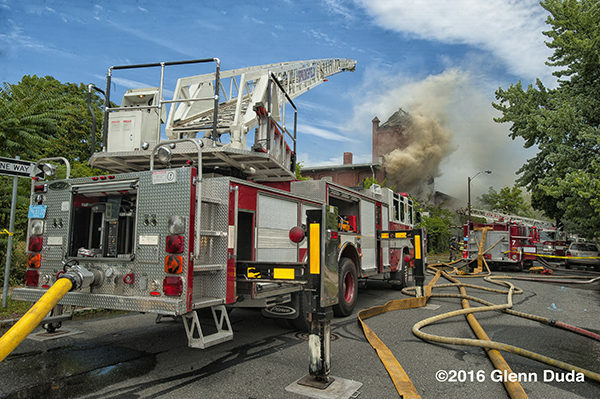 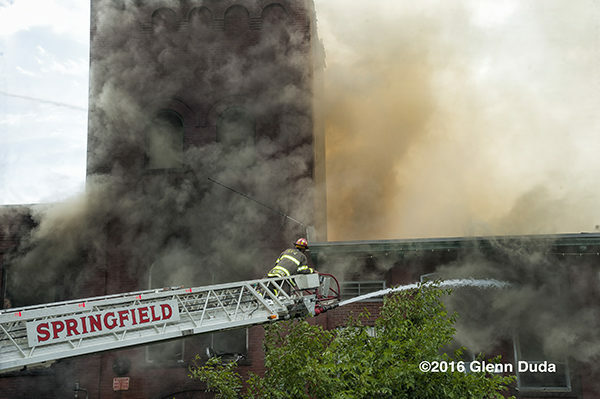 Springfield, MA 2nd alarm at 140 Wilbraham Ave 06/27/16 – Companies arrived to find a heavy smoke condition emanating from a multi-story, mill building. 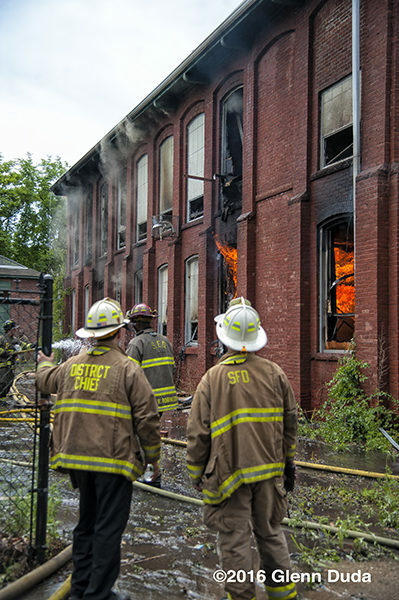 An interior attack was quickly initiated, but was transitioned to an exterior attack due to deep seated fire conditions within the building. 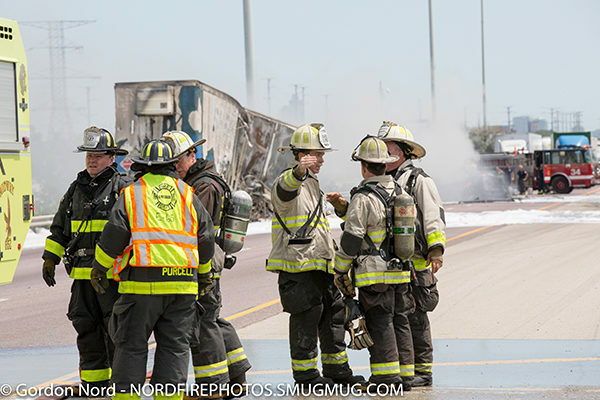 A second alarm was transmitted on the box bringing an additional two engines and truck. 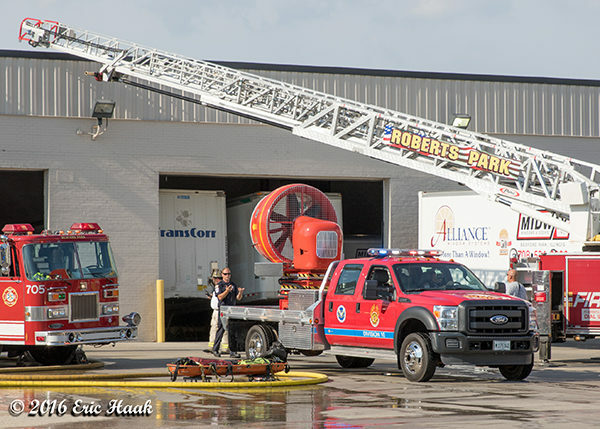 Companies set up for a long duration defensive fight. 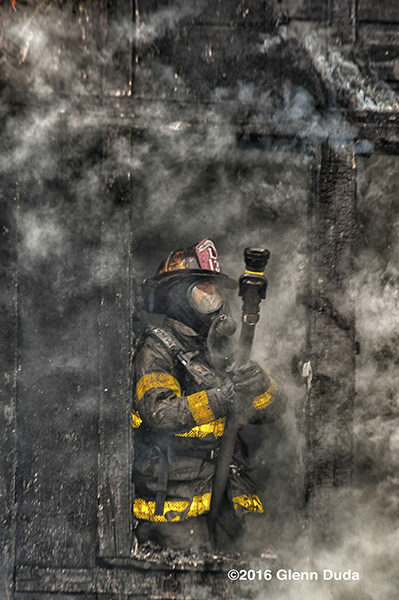 The fire burned for more than six hours with conditions worsening due to a steady wind blowing. 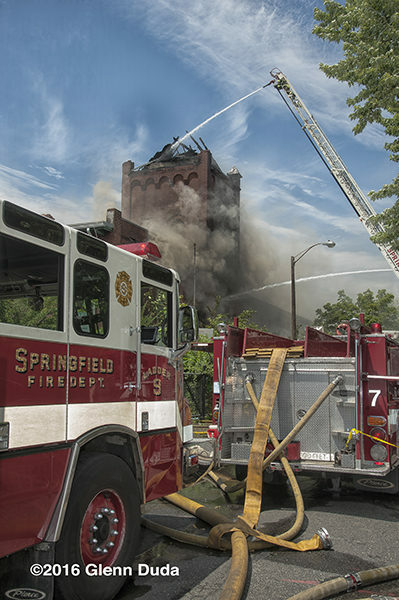 The fire would spread to the number four side wing before an excavator breached a wall and allowed firefighters to gain access to the deep seated fire. 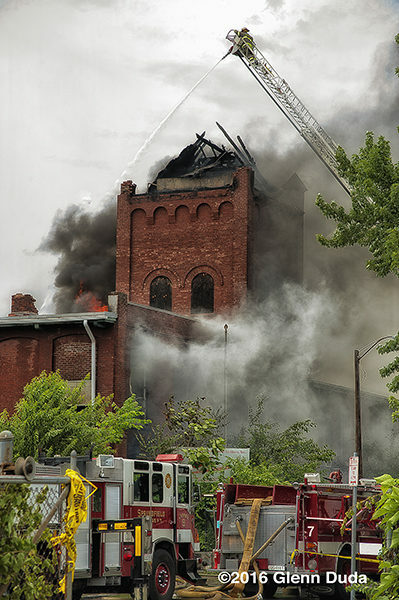 The blaze was declared under control some eight hours after the initial alarm. 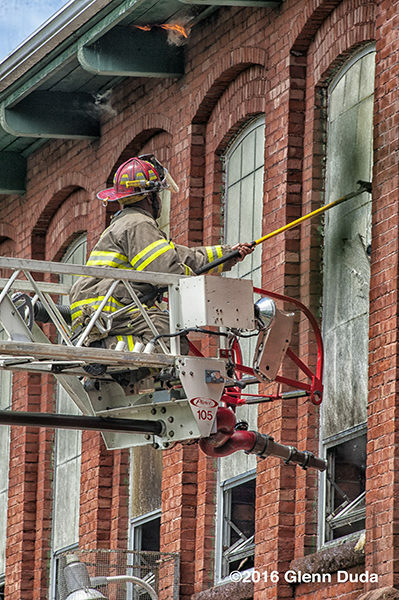 The cause of the fire is being investigated by the marshals and Massachusetts State Police. 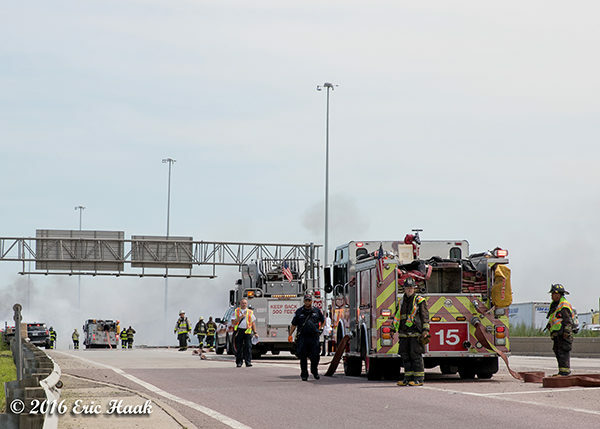 Several firefighters were treated for heat exhaustion on scene.